1. In a food processor, blitz the biscotti to crumbs. Mix with the melted butter, then press the crumb mixture onto the base of a greased 23cm spring-form cake tin. Chill until needed. 2. Reserve a few blackberries to decorate the cake. Lightly squash the remaining blackberries with the back of a fork, then fold through the ice cream so it has ripples of fruit throughout. Spread over the biscuit base. Freeze for 5 hours or overnight. 3. 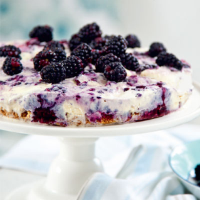 Decorate the ice-cream cake with the reserved blackberries and serve.